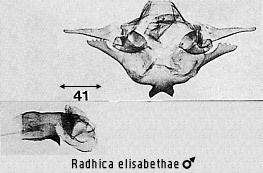 Radhica elisabethae Lajonqui�re, 1977b: 186. Radhica elisabethae Lajonqui�re; Barlow, 1982: 51. Diagnosis. Both wings are a dull, rather yellowish green. See also Radhica himerta Swinhoe. Taxonomic notes. The species is variable, sometimes with a dark grey zone on the hindwing dorsum and less frequently with grey shading distal to the postmedial. Forms with reduced markings are f. intacta Lajonqui�re. Habitat preference. The species has been taken infrequently in Brunei and Sarawak, in habitats ranging from coastal vegetation through lowland heath forest to upper montane forest.